Guys Lit Wire: Doug TenNapel, Revisited. Doug TenNapel’s new graphic novel, Ghostopolis, inspired me to re-read some of his older titles. While he is probably best known as a creator of the Earthworm Jim character for video games, here are my favorite graphic novels from this author. Creature Tech has always been my favorite of TenNapel’s. With a background in theology 19-year old Michael Ong turns to science, wins a Nobel Prize and is then contacted by the U.S. government. Michael is forced to return to Turlock, California to run the Research Technical Institute, otherwise known as Creature Tech. Back in his home town, he is going through a rebellious stage making him clash with his preacher father. Every day Michael deals with government secrets and strange creatures. When an evil doctor is resurrected by the Shroud of Turin, Michael has to stop him from destroying the world. Of course the most important aspect of Creature Tech is that there are lots of monsters and a humongous space eel. 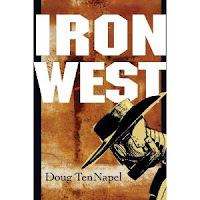 Iron West is a steam-punk take on an outlaw who is deputized in an emergency. In California in 1898, some prospectors accidentally awaken some deadly metal robots. Preston Struck always looks out for himself, but a near death experience and his alliance with a mysterious shaman and Bigfoot begins to alter his path. Doug TenNapel's Gear is fairly bizarre but follows the author's heavy use of monsters and robots. The art style with its vibrant colors strikes a different tone than in many of his other graphic novels. Amid the manic energy of a book about war, cats, theology and the afterlife, is a deeper story about choices and consequences. this is a good one to go through multiple times because it is a quick read, yet I find more to think about each with each reading. TenNapel's catalog of graphic novels is among the best our there right now. They are all exciting, with great action and humor, yet TenNapel injects themes of redemption and courage to make you think. Fans of Kazu Kibuishi's graphic novels, especially Daisy Kutter, will enjoy these works by Doug TenNapel. If I remember correctly, TenNapel grew up close to there as well.